US, 1975, 99 minutes, Colour. Robert Stack, Ralph Bellamy, David Hedison, Bradford Dillman, Sorrell Booke, Burr de Benning, John Randolph. 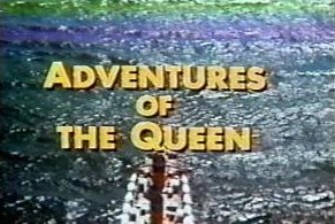 Adventures of the Queen is a telemovie produced by Irwin Allen (The Poseidon Adventure, The Towering Inferno). It is conventional disaster on-board material with a bomb plot. There are, as expected, good special effects. The film is of interest as it was made on the Queen Mary. Conventional and enjoyable disaster material. 1. An entertaining telemovie? Values, escapism? 2. The film within the context of the disaster genre? Its derivation from the major film of the early '70s with disaster, ships, bombs, passengers? Was the film better than average disaster material? 3. Telemovie techniques, photography, the use of the Queen Mary for locations? Music? Special effects? 4. The credibility of the basic plot? For the purposes of the disaster? The passengers and their personalities, emotional conflicts, motivation? The Captain? Reed? Dundeen? The mystery, the dramatics of the danger, the resolution? Audience involvement? 5. How well delineated were the principal characters? The Captain and his personality, responsibility, coping with the situation? Reed, his motivations, skill, madness? The doctor? Dundeen and his involvement and the reason for the bombing? The other characters as interesting and contributing to the plot? 6. The way of life on the ship, the transition when danger arose? The particular crises and the way they were handled? 7. Basic themes of human life, disaster, danger, madness, heroism?